This article is about the English city. For other uses, see Winchester (disambiguation). Winchester is a city and the county town of Hampshire, England. The city lies at the heart of the wider City of Winchester, a local government district, and is located at the western end of the South Downs National Park, along the course of the River Itchen. 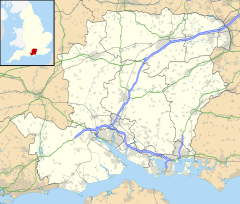 It is situated 60 miles (97 km) south-west of London and 13.6 miles (21.9 km) from Southampton, its closest city. At the time of the 2011 Census, Winchester had a population of 45,184. The wider City of Winchester district which includes towns such as Alresford and Bishop's Waltham has a population of 116,800. Winchester developed from the Roman town of Venta Belgarum, which in turn developed from an Iron Age oppidum. Winchester's major landmark is Winchester Cathedral, one of the largest cathedrals in Europe, with the distinction of having the longest nave and overall length of all Gothic cathedrals in Europe. The city is home to the University of Winchester and Winchester College, the oldest public school in the United Kingdom still using its original buildings. The area around Winchester has been inhabited since prehistoric times, with three Iron Age hillforts, Oram's Arbour, St. Catherine's Hill, and Worthy Down all in the nearby vicinity. In the Late Iron Age, a more urban settlement type developed, known as an oppidum, although the archaeology of this phase remains obscure. It was overrun by the confederation of Gaulish tribes known as the Belgae sometime during the first century BCE. It seems to have been known as Wentā or Venta, derived from the Brittonic for "town" or "meeting place", or the word for "white" (Welsh gwyn), due to Winchester's situation upon chalk. After the Roman conquest of Britain, the settlement served as the capital (Latin: civitas) of the Belgae and was distinguished as Venta Belgarum, "Venta of the Belgae". Although in the early years of the Roman province it was of subsidiary importance to Silchester and Chichester, Venta eclipsed them both by the latter half of the second century. At the beginning of the third century, Winchester was given protective stone walls. At around this time the city covered an area of 144 acres (58 ha), making it among the largest towns in Roman Britain by surface area. There was a limited suburban area outside the walls. Like many other Roman towns however, Winchester began to decline in the later fourth century. Following the Roman withdrawal from Britain in 410, urban life seems to have continued at Venta Belgarum until around 450 AD, and a small administrative centre might have continued after that on the site of the later Anglo-Saxon palace. Ford identifies the community as the Cair Guinntguic ("Fort Venta") listed by Nennius among the 28 cities of Britain in his History of the Britons. Amid the Saxon invasions of Britain, cemeteries dating to the 6th and 7th centuries suggest a revival of settlement. The city became known as Wintan-ceastre ("Fort Venta") in Old English. In 648, King Cenwalh of Wessex erected the Church of SS Peter and Paul, later known as the Old Minster. This became a cathedral in the 660s when the West Saxon bishopric was transferred from Dorchester-on-Thames. The present form of the city dates to reconstruction in the late 9th century, when King Alfred the Great obliterated the Roman street plan in favour of a new grid in order to provide better defence against the Vikings. The city's first mint appears to date from this period. In the early tenth century there were two new ecclesiastical establishments, the convent of Nunnaminster, founded by Alfred's widow Ealhswith, and the New Minster. Bishop Æthelwold of Winchester was a leading figure in the monastic reform movement of the later tenth century. He expelled the secular canons of both minsters and replaced them with monks. He created the drainage system, the 'Lockburn', which served as the town drain until 1875, and still survives. Also in the late tenth century, the Old Minster was enlarged as a centre of the cult of the ninth century Bishop of Winchester, Saint Swithun. The three minsters were the home of what architectural historian John Crook describes as "the supreme artistic achievements" of the Winchester School. The consensus among historians of Anglo-Saxon England is that the court was mobile in this period and there was no fixed capital. Martin Biddle has suggested that Winchester was a centre for royal administration in the seventh and eighth centuries, but this is questioned by Barbara Yorke, who sees it as significant that the shire was named after Hamtun, the forerunner of Southampton. However, Winchester is described by the historian Catherine Cubitt as "the premier city of the West Saxon kingdom." There was a fire in the city in 1141 during the Rout of Winchester. William of Wykeham played a role in the city's restoration. As Bishop of Winchester he was responsible for much of the current structure of the cathedral, and he founded the still extant public school Winchester College. During the Middle Ages, the city was an important centre of the wool trade, before going into a slow decline. The curfew bell in the bell tower (near the clock in the picture), still sounds at 8:00 pm each evening. 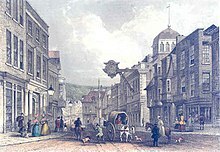 Winchester High Street in the mid 19th century. While Jews lived in Winchester from at least 1148, in the 13th century the Jewish community in the city was one of the most important in England. There was an archa in the city, and the Jewish quarter was located in the city's heart (present day Jewry street). There were a series of blood libel claims levied against the Jewish community in the 1220s and 1230s, which likely was the cause of the hanging of the community's leader, Abraham Pinch, in front of the synagogue that he was head of. Simon de Montfort ransacked the Jewish quarter in 1264, and in 1290 all Jews were expelled from England. The City Cross (also known as the Buttercross) has been dated to the 15th century, and features 12 statues of the Virgin Mary, saints and various historical figures. Several statues appear to have been added throughout the structure's history. In 1770, Thomas Dummer purchased the Buttercross from the Corporation of Winchester, intending to have it re-erected at Cranbury Park, near Otterbourne. When his workmen arrived to dismantle the cross, they were prevented from doing so by the people of the city, who "organised a small riot" and they were forced to abandon their task. The agreement with the city was cancelled and Dummer erected a lath and plaster facsimile, which stood in the park for about sixty years before it was destroyed by the weather. The Buttercross itself was restored by George Gilbert Scott in 1865, and still stands in the High Street. It is now a Scheduled Ancient Monument. Three notable bronze sculptures can be seen in or from the High Street by major sculptors of the 19th and 20th Centuries, the earliest a monumental statue of Queen Victoria, now in the Great Hall, by Sir Alfred Gilbert (also known as the sculptor of 'Eros' in London's Piccadilly Circus), King Alfred, facing the city with raised sword from the centre of The Broadway, by Hamo Thornycroft and the modern striking Horse and Rider by Dame Elizabeth Frink at the entrance to the Law Courts. The novelist Jane Austen died in Winchester on 18 July 1817 and is buried in the cathedral. While staying in Winchester from mid-August to October 1819, the Romantic poet John Keats wrote "Isabella", "St. Agnes' Eve", "To Autumn", "Lamia" and parts of "Hyperion" and the five-act poetic tragedy "Otho The Great". In 2013, businesses involved in the housing market were reported by a local paper as saying the city's architectural and historical interest, and its fast links to other towns and cities have led Winchester to become one of the most expensive and desirable areas of the country and ranked Winchester as one of the least deprived areas in England and Wales. Winchester is situated on a bed of cretaceous lower chalk with small areas of clayey and loamy soil, inset with combined clay and rich sources of fuller's earth. As with the rest of the UK, Winchester experiences an oceanic climate (Köppen Cfb). The nearest Met Office station is in Martyr Worthy, just outside the city. Since 1974 the city has been governed as part of the wider City of Winchester district of Hampshire. Of the district's 26 electoral wards, 7 cover the area of the city itself: Olivers Battery & Badger Farm, St John & All Saints, St Barnabas, St Michael, St Bartholomew, St Luke, and St Paul. Winchester local elections take place in three out of every four years, with one third of the councillors elected in each election. From the 2006 election until the 2010 election the council was led by Conservatives. In 2010 briefly by the Liberal Democrats again and since 2011 by the Conservatives. From 1835 to 1974, Winchester was governed as a municipal borough of Hampshire. Until 1902 the city's affairs were also administered partly by its parishes: St Lawrence, St Mary Kalendar, St Maurice, St Michael, St Peter Colebrook, St Swithin, St Thomas, St John, St Bartholomew Hyde, Milland, St Faith, and St Peter Cheesehill, and its extra-parochial areas: Cathedral Precincts, St Mary's College Precincts, St Cross Hospital Precinct, and Wolvesey. Historically, the south of the city had come under the "Liberty of the Soke", thereby self-governing to a large extent. Winchester is currently represented in the House of Commons through the Winchester Parliamentary Constituency by Steve Brine of the Conservatives who in the General Election of 2010 beat Martin Tod, the Liberal Democrat candidate, by 3048 votes (a margin of 5.4%). Mark Oaten had previously won the seat for the Liberal Democrats during the 1997 general election in which he defeated Gerry Malone, a Health Minister in John Major's Conservative Government who had held the seat since 1992. A view of Winchester Cathedral. Winchester Cathedral was originally built in 1079 and remains the longest Gothic cathedral in Europe. It contains much fine architecture spanning the 11th to the 16th century and is the place of interment of numerous Bishops of Winchester (such as William of Wykeham), Anglo-Saxon monarchs (such as Egbert of Wessex) and later monarchs such as King Canute and William Rufus. It was once an important pilgrimage centre and housed the shrine of Saint Swithun. The ancient Pilgrims' Way travelling to Canterbury begins at Winchester. The plan of the earlier Old Minster is laid out in the grass adjoining the cathedral. The New Minster (the original burial place of Alfred the Great and Edward the Elder) once stood beside it. The cathedral has a girls choir and a boys choir, which sing on a regular basis at the cathedral. Winchester Cathedral Close contains a number of historic buildings from the time when the cathedral was also a priory. Of particular note is the Deanery, which dates back to the thirteenth century. It was originally the Prior's House, and was the birthplace of Arthur, Prince of Wales, in 1486. Not far away is Cheyney Court, a mid fifteenth-century timber-framed house incorporating the Porter's Lodge for the Priory Gate. It was the Bishop's court house. The earliest hammer-beamed building still standing in England is situated in the Cathedral Close, next to the Dean's garden. It is known as the Pilgrims' Hall, as it was part of the hostelry used to accommodate the many pilgrims to Saint Swithun's shrine. Left-overs from the lavish banquets of the Priors (the monastic predecessors of the later Deans) would be given to the pilgrims who were welcome to spend the night in the hall. It is thought by Winchester City Council to have been built in 1308. Now part of The Pilgrims' School, the hall is used by the school for assemblies in the morning, drama lessons, plays, orchestral practices, Cathedral Waynflete rehearsals, the school's Senior Commoners' Choir rehearsals and so forth. Entrance to the North garth of the cathedral, for pedestrians is via the Norman arches of Saint Maurice′s tower, in the High street. Wolvesey Castle was the Norman bishop's palace, dating from 1110, but standing on the site of an earlier Saxon structure. It was enhanced by Henry de Blois during the Anarchy of his brother King Stephen's reign. He was besieged there for some days. In the 16th century, Queen Mary Tudor and King Philip II of Spain were guests just prior to their wedding in the Cathedral. The building is now a ruin (maintained by English Heritage), but the chapel was incorporated into the new palace built in the 1680s, only one wing of which survives. Winchester is well known for the Great Hall of its castle, which was built in the 12th century. The Great Hall was rebuilt sometime between 1222 and 1235, and still exists in this form. 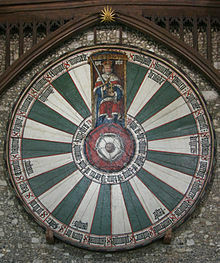 It is famous for King Arthur's Round Table, which has hung in the hall from at least 1463. The table actually dates from the 13th century, and as such is not contemporary to Arthur. Despite this it is still of considerable historical interest and attracts many tourists. The table was originally unpainted, but was painted for King Henry VIII in 1522. The names of the legendary Knights of the Round Table are written around the edge of the table surmounted by King Arthur on his throne. Opposite the table are Prince Charles's 'Wedding Gates'. In the grounds of the Great Hall is a recreation of a medieval garden. Apart from the hall, only a few excavated remains of the stronghold survive among the modern Law Courts. The buildings were supplanted by the adjacent King's House, now incorporated into the Peninsula Barracks where there are five military museums. (The training that used to be carried out at the barracks is now done by the Army Training Regiment Winchester, based at the Sir John Moore Barracks, 2 miles (3 km) outside the city). The almshouses and vast Norman chapel of Hospital of St Cross were founded just outside the city centre by Henry de Blois in the 1130s. Since at least the 14th century, and still available today, a 'wayfarer's dole' of ale and bread has been handed out there. It was supposedly instigated to aid pilgrims on their way to Canterbury. 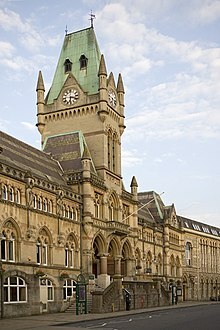 Other important historic buildings include the Guildhall dating from 1871 in the Gothic revival style, the Royal Hampshire County Hospital, designed by William Butterfield, and Winchester City Mill, one of the city's several water mills driven by the River Itchen that runs through the city centre. The mill has recently been restored, and is again milling corn by water power. It is owned by the National Trust. Castle Hill is the location of the Council Chamber for Hampshire County Council. Between Jewry Street and St Peter's Street is St Peter's Catholic Church. It was built in 1924 and designed by Frederick Walters. Next to it is Milner Hall, built in the 1780s it was the first Catholic church to be consecrated since 1558. Wikimedia Commons has media related to Winchester painted bollards. Winchester has a variety of Church of England primary schools, including both state and private provision schools. St. Peters Catholic Primary School had the highest SATS results, after achieving a perfect score of 300 in 2011. There are four state comprehensive secondary schools in Winchester; the Henry Beaufort School, Kings' School Winchester, and The Westgate School are all situated in the city. A fourth state school, the Osborne School, a community special school is also located in Winchester. Independent junior/preparatory schools are The Pilgrims' School Winchester, the Prince's Mead School and Twyford School, which is just outside the city and claims to be the oldest preparatory school in the United Kingdom. There are two major independent senior schools in Winchester, St Swithun's (a day and boarding school for girls from nursery to sixth form) and Winchester College, a boys' public school. Both schools often top the examination result tables for the city and county. Osborne School is a state-funded special school for pupils aged 11 to 19 which is located in Winchester. Shepherds Down Special School is a state funded special school for pupils aged 4 to 11, located just outside of the city in the boundaries of Compton. The University of Winchester (formerly King Alfred's College) is a public university based in Winchester and the surrounding area. It is ranked 10th for teaching excellence in The Times and The Sunday Times 2016 Good University Guide, with a 92% rating, and fourth for student satisfaction in England in the National Student Survey 2015. The University origins go back as far as 1840—originally as a Diocesan teacher training centre. King Alfred's, the main campus, is located on a purpose built campus near the city centre. The newly completed West Downs is a short walk away, and houses student facilities and accommodation and the business school. The Winchester School of Art was founded in the 1860s as an independent institution and is now a school of the University of Southampton. Peter Symonds College is a college that serves Winchester. It began as a Grammar School for boys in 1897, and became a co-educational sixth-form college in 1974. Winchester has Winchester City F.C. who currently play in the Southern League and Winchester Castle F.C., who have played in the Hampshire League since 1971. The local Saturday football league, the Winchester & District League, folded in 2010. Winchester City Flyers are a girls and ladies football club established in 1996 with nearly 200 members, playing from U9 to ladies football. The St. Cross Symondians Cricket Club is one of the first cricket clubs in Hampshire, and, with 5 men's sides, 2 women's sides, a successful junior's side, and weekend sides, is one of the largest as well. Lawn bowls is played at several clubs. The oldest bowling green belongs to Friary Bowling Club (first used in 1820), while the oldest bowls club is Hyde Abbey Bowling Club (established in 1812). Riverside Indoor Bowling Club remains open during the winter months. There are three 18-hole golf courses. Royal Winchester Golf Club is on downland adjacent to the Clarendon Way with fine views over distant country. "JH" John Henry Taylor was the club professional when winning the Open Championship in 1894 and 1895, and there is a room with memorabilia named after him. Hockley Golf Club is dramatically positioned on St Catherine's Hill, also with extensive views. South Winchester Golf Club is another downland course, and a relative newcomer, designed by David Thomas and Peter Alliss. Visitors are welcome at all three clubs. Winchester College invented and gave its name to Winchester College Football, played exclusively at the College and in some small African/South American communities. Winchester is located near the M3 motorway and at the meeting of the A34, A31, A3090 and A272 roads. Once a major traffic bottleneck, the city still suffers from congestion at peak times. It is just to the south of the A303 and A30. A Roman road originating in Salisbury called The Clarendon Way ends in Winchester. The Clarendon Way is now a recreational footpath. Local, rural and Park and Ride bus services are provided by Stagecoach South, who run to Andover, Alton, Basingstoke, Petersfield, Romsey and Fareham. Bluestar provide services to Eastleigh and Southampton. Many services are subsidised by Hampshire County Council and community transport schemes are available in areas without a regular bus service. National Express coaches provide services mainly to Bournemouth, Poole, Portsmouth and London. Megabus also provide long-distance services. Winchester railway station is served by South Western Railway trains from London Waterloo, Weymouth, Portsmouth and Southampton, as well as by CrossCountry between Bournemouth, and either Manchester or Newcastle via Birmingham. Historically it was also served by a line to London via Alton, which partially survives as the Watercress Line. The closure of this line removed an alternative route between London and Winchester when, due to engineering works or other reasons, the main line was temporarily unusable. There was a second station called Winchester Chesil served by the Didcot, Newbury and Southampton Railway, this closed in the 1960s. This line provided a link to the Midlands and the North, bypassing the present longer route through Reading. Winchester Combined Court Centre consists of a crown court and county court. It is administered by Her Majesty's Courts Service, an Executive Agency of the Ministry of Justice. Winchester is a first-tier court centre and is visited by High Court judges for criminal and for civil cases (in the District Registry of the High Court). One of the most high-profile cases to be heard here was the Rose West murder trial in 1995. Winchester has a separate district probate registry, which is part of the High Court. This Court is separate from the main court establishment at the top of Winchester High Street and deals only with probate matters. There is a heavily populated Victorian prison, HMP Winchester, opposite the hospital, on the B3040 heading up west from the town centre. Since 1974 Winchester has hosted the annual Hat Fair, a celebration of street theatre that includes performances, workshops, and gatherings at several venues around the city. In 1974 a cycle of medieval mystery plays were staged in the grounds of Wolvesey Castle. Winchester is the home of the award-winning Blue Apple Theatre, a company of actors. Winchester hosts one of the UK's larger farmers' markets, with about 100 stalls. It is certified by FARMA. The market takes place on the second and last Sunday of the month in the city centre. Four newspapers are published for Winchester. The weekly paid-for Hampshire Chronicle, which started out in 1772 reporting national and international news, now concentrates on Winchester and the surrounding area. The Southern Daily Echo mostly concerns Southampton, but does also feature Winchester. It has an office shared with sister paper the Hampshire Chronicle. The Mid-Hants Observer is a free, weekly independent paper for Winchester and nearby villages. Its sister paper, the weekly Hampshire Independent, which covers the whole county, is also based in Winchester. The free Winchester News Extra closed in 2017. Winchester had its own radio station, Win FM, from October 1999 to October 2007. In October 2006, the Channel 4 television programme The Best And Worst Places To Live In The UK, the city was celebrated as the "Best Place in the UK to Live in: 2006". In the 2007 edition of the same programme, Winchester had slipped to second place, behind Edinburgh. A number of public figures and celebrities were students at Peter Symonds College in Winchester, including TV presenter and model Alexa Chung, singer-songwriter and drummer Andy Burrows, glamour model Lucy Pinder, comedian Jack Dee, Magician Ben Hart and singer/actress Gina Beck. Harlequins rugby and England rugby player Joe Marchant. Actor Colin Firth is from Winchester and was educated at Montgomery of Alamein School (now Kings' School). The adventurer and model Laura Bingham was born and brought up in the local area attending The Westgate School. The singer-songwriter Frank Turner hails from Winchester, a fact that he often mentions at concerts as well as in his songs. The band Polly and the Billets Doux formed in Winchester, and are still based in the city. 2011 saw Winchester's first ever Oxjam Takeover music festival, held on 22 October. In March 2016, Winchester was named as the best place to live in Britain by the "Sunday Times Best Places To Live" guide. In the medieval narrative poem, Sir Orfeo, the main character Sir Orfeo is King of Winchester, which is said to be the modern name of Thrace. The final combat of the romance hero Guy of Warwick against the giant Colbrand takes place outside the walls of Winchester. The Late Middle Ages author Sir Thomas Malory identified Winchester as the mythical home of Camelot and King Arthur in Le Morte d'Arthur, his collection of medieval legends about the Arthurian myths. (Malory's editor William Caxton disputed this, insisting that Camelot must be in Wales). A scene in Henry Esmond (1852) by William Makepeace Thackeray is set in the choir of Winchester cathedral. Winchester is in part the model for Barchester in the Barsetshire novels of Anthony Trollope, who attended Winchester College; The Warden (1855) is said to be based on a scandal at the Hospital of St Cross. A fictionalised Winchester appears as Wintoncester in Hardy's Tess of the d'Urbervilles (1891). Some of the action in Sir Arthur Conan Doyle's The Adventure of the Copper Beeches (1892) takes place in the city—the Black Swan hotel mentioned in the story formerly stood at the end of Southgate St and is still acknowledged by a figure on the outside of the building. In Charles Kingsley's romantic history Hereward the Wake (1866), Hereward smashes his ash lance against the doors of the Westgate, Winchester showing by the strength of his arm that it is he. William the Conqueror is so impressed that he pardons him. A fictitious estate near Winchester is the scene of a crime in the Sherlock Holmes adventure, The Problem of Thor Bridge (1922). In Gerry Anderson's 1967 and 1968 programme Captain Scarlet and the Mysterons, background material published by, or with the approval of, Anderson identifies Winchester as the birthplace of the main character, Captain Scarlet, real name Paul Metcalfe. Winchester is the main location of John Christopher's post-apocalyptic science fiction series, Sword of the Spirits. Winchester Cathedral is featured in James Herbert's horror novel The Fog. The Siege of Winchester in 1141, part of The Anarchy (a civil war) between King Stephen and the Empress Matilda, is an important plot element in the detective novel An Excellent Mystery, part of the Brother Cadfael chronicles by Edith Pargeter writing as Ellis Peters. In Philip Pullman's novel The Subtle Knife (part of the His Dark Materials trilogy) the main male protagonist, Will Parry, comes from Winchester. However, little of the book is set there. In the movie Merlin, King Uther's first conquest of Britain begins with Winchester, which Merlin foresaw would fall. In the novel The Pillars of the Earth, by Ken Follett, which traces English historical events from 1123 C.E. to 1174 C.E., Winchester and its cathedral figure prominently in several chapters. The fictional town of Kingsbridge in the novel is based on Winchester, as Follett explained in the first episode of his Channel 4 2013 documentary series Ken Follett's Journey into the Dark Ages. Accounts of wool merchants and their trading with sheep farmers in Winchester are related to the reader. The reign of Stephen is described and his military actions are recounted, including first-person "reporting" of the Battle of Lincoln on 2 February 1141. In the Japanese manga Death Note, The Wammy's House, an orphanage founded by Quillish Wammy, where the detective L's successors (Mello, Near, and Matt) are raised, is located in Winchester. In the novel One Day by David Nicholls, the male protagonist Dexter Mayhew went to the public school Winchester College. This is frequently referred to throughout the book, as well as mentioning St. Swithin's Day and the St. Swithin's weather myth. Patrick Gale's 2009 book The Whole Day Through is set in Winchester. In S. M. Stirling's 2007 novel, The Sunrise Lands, it is revealed that the British capital has been moved to Winchester. Winchester is an important setting in The Saxon Stories by Bernard Cornwell. Frank Turner (singer-songwriter) who was raised in the nearby village of Meonstoke (part of the City of Winchester district), wrote and performs the song "Wessex Boy" describing Winchester, and how it remains his home. He names the Cathedral, the Buttercross and Jewry Street in his homage to the city. Winchester, Virginia, is named after the English city, whose Mayor has a standing invitation to be a part of the American city's Shenandoah Apple Blossom Festival. Winchester also gave its name (Frenchified to Bicêtre) to a suburb of Paris, from a manor built there by John of Pontoise, Bishop of Winchester, at the end of the 13th century. It is now the commune of Le Kremlin-Bicêtre. ^ "Winchester Key Facts". Hampshire County Council. Archived from the original on 8 January 2015. Retrieved 19 November 2015. ^ Landranger 185: Winchester & Basingstoke. Ordnance Survey. 2005. ISBN 978-0-319-22884-5. ^ "2011 Census: KS101EW Usual resident population, local authorities in England and Wales". National Statistics. Retrieved 5 January 2015. ^ Long, Henry Lawes (1836). Observations Upon Certain Roman Roads and Towns in the South of Britain. Oxford University: Nichols and sons. p. 26. ISBN 978-1354701065. Retrieved 17 October 2018. ^ "Winchester". Historic-uk.com. Retrieved 26 October 2012. ^ a b "Major Roman Settlements". British towns. Retrieved 18 June 2014. ^ "PJO archaeology". Retrieved 22 January 2011. ^ "A History of Winchester". Localhistories.org. Retrieved 26 October 2012. ^ Nennius (attrib.). Theodor Mommsen (ed.). Historia Brittonum, VI. Composed after AD 830. (in Latin) Hosted at Latin Wikisource. ^ Ford, David Nash. "The 28 Cities of Britain" at Britannia. 2000. ^ "'Wintan-ceaster'". Anglo Saxon Dictionary. Bosworth-Toller. Retrieved 18 June 2014. ^ Stenton, Frank M. (1971). Anglo-Saxon England (3rd ed.). Clarendon Press. p. 539. ISBN 978-0-19-280139-5. ^ Foot, Sarah (2011). 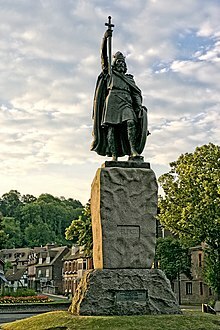 Æthelstan: the first king of England. Yale University Press. p. 78. ISBN 978-0-300-12535-1. ^ Yorke, Barbara (1982). "The Foundation of the Old Minster and the Status of Winchester in the Seventh and Eighth Centuries". Proceedings of the Hampshire Field Club and Archaeological Society (38): 79–80. ISSN 0142-8950. ^ Cubitt, Catherine (2009). "Pastoral Care and Religious Belief". In Stafford, Pauline. A Companion to the Early Middle Ages: Britain and Ireland c.500- c.1100. Chichester, UK: Wiley-Blackwell. p. 399. ISBN 978-1-118-42513-8. ^ "The Jewish Community of Winchester". The Museum of the Jewish People at Beit Hatfutsot. Retrieved 2 July 2018. ^ "The Buttercross, Winchester". City of Winchester. 1998. Retrieved 23 September 2009. ^ Yonge, Charlotte M. (1898). "Chapter 8: Old Otterbourne". John Keble's Parishes. Online literature. Retrieved 23 September 2009. ^ "City Cross or 'Butter Cross', Winchester". Historic England. Retrieved 16 December 2016. ^ "Jane Austen 'died from arsenic poisoning'". The Guardian. 14 November 2011. Retrieved 18 June 2014. ^ "John Keats – autumnal idealist or trenchant social commentator?". The Guardian. 23 March 2012. Retrieved 18 June 2014. ^ a b "Winchester hits top ten list of places to live in the UK". Hampshire Chronicle. 26 December 2013. Retrieved 18 June 2014. ^ "Winchester, Hampshire climate tables". Met Office. ^ "Winchester". BBC News. 19 April 2008. Retrieved 4 February 2010. ^ "Winchester: Introduction - British History Online". www.british-history.ac.uk. ^ "Winchester MB through time". www.visionofbritain.org.uk. ^ "Winchester: The soke - British History Online". www.british-history.ac.uk. ^ "Winchester Soke/Liberty through time". www.visionofbritain.org.uk. ^ Andrew Napier (May 2010). "Tories sweep in but lose control of city council". Hampshire Chronicle. Retrieved 7 August 2010. ^ a b Dodson, Aidan (2004). The Royal Tombs of Great Britain. London: Gerald Duckworth & Co.
^ Hampshire Churches, Margaret Green,Winton Pubs.Ltd.1967. Page 90. ^ "Winchester's Military Museums". Winchester's Military Museums. Retrieved 15 April 2012. ^ "MOD Training and Education". MOD Training. Ministry of Defence. Retrieved 18 June 2014. ^ "The City Museum, Winchester". City of Winchester. 1998. Retrieved 12 July 2012. ^ "Hampshire and Winchester museums and art leased to trust". BBC News. 1 November 2014. Retrieved 4 November 2014. ^ a b "History of Winchester Guildhall". Winchester Museum Collection. Retrieved 18 June 2014. ^ "Map" (PDF). Hampshire County Council. Retrieved 2 September 2017. ^ "Primary Schools (KS1 and 2)". Hampshire Chronicle. Retrieved 17 June 2014. ^ "Winchester College Guise". Winchester College. Retrieved 17 June 2014. ^ "Winchester College grades". Winchester College. Retrieved 17 June 2014. ^ "The University of Winchester - The Student Room". www.thestudentroom.co.uk. ^ "Our Campuses". Winchester.ac.uk. Archived from the original on 3 November 2012. Retrieved 26 October 2012. ^ "Winchester Hockey Club". Winchesterhc.co.uk. 14 April 2011. Retrieved 3 June 2011. ^ Harold Thomas. The Friary Bowling Club 1820–1970. ^ "Bowled over by support from mayors". Hampshire Chronicle. 18 April 2012. Retrieved 13 August 2013. ^ "The Clarendon Way". Hampshire County Council. Archived from the original on 24 September 2012. Retrieved 8 December 2012. ^ a b "Winchester Bus & Train Travel Times". Hampshire County Council. 2011. ^ "The Probate Service - Registries". Her Majesty's Courts Service. Archived from the original on 6 June 2011. Retrieved 10 October 2010. ^ "Under-fire jail criticised again". bbc.co.uk. 5 April 2005. Retrieved 12 February 2009. ^ "Blue Apple Theatre Honored with Queen's Award for Voluntary Service 2012". Westend.broadwayworld.com. 23 June 2012. Retrieved 26 October 2012. ^ "Blue Apple Theatre to take Hamlet on the road (From Hampshire Chronicle)". Hampshirechronicle.co.uk. 2 February 2012. Retrieved 26 October 2012. ^ "Oxjam in Winchester". Oxjam. Archived from the original on 2 November 2014. Retrieved 18 June 2014. ^ "Winchester named best place to live in Britain". ^ "Captain Scarlet bio". Aardman. Retrieved 17 June 2014. ^ "Ken Follett's Journey into the Dark Ages". Channel 4. 2013. Retrieved 1 March 2013. ^ a b "David Nicholls One Day - overview". Writer.com. David Nicholls. Archived from the original on 28 May 2014. Retrieved 18 June 2014. ^ "David Nicholls, the man who made a nation cry". The Guardian. 7 August 2011. Retrieved 18 June 2014. ^ a b c "Twin Towns in Hampshire". Www3.hants.gov.uk. Archived from the original on 30 November 2009. Retrieved 6 November 2009. ^ "Home". Winchestertwinning.org.uk. Retrieved 6 November 2009. ^ "British towns twinned with French towns". Archant Community Media Ltd. Retrieved 11 July 2013. ^ "Gießen: Städtepartnerschaften" [Giessen: Twin towns] (in German). Stadt Gießen. Archived from the original on 13 April 2013. Retrieved 1 August 2013. Wikimedia Commons has media related to Winchester. Wikivoyage has a travel guide for Winchester (England).